Image View Description: Lyman A. 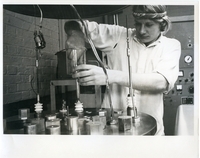 Page, Jr. conducting an experiment in a lab titled "Superconducting Thin Film Deposition." Image View Description: Portrait of former Governor Percival P. Baxter of Maine (right) and his sister Madeline, the late Mrs. Fenton Tomlinson, painted when he was 6 yrs old and she was 4. The painting, titled "Babes in the Woods", was done by Eastman Johnson n 1881. 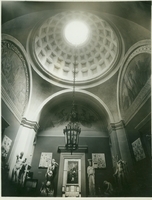 The work, a family heirloom of Governor Baxter, has been given by him to the Museum of Art at Bowdoin college, his alma mater. Image View Description: Informal portrait of the Bowdoin Class of 1950 at a reunion, holding a banner titled "1950: Bowdoin's Biggest and Best Class". 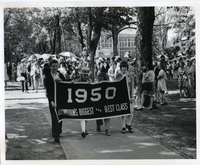 Image View Description: Front view of a banner carried by the children of the Bowdoin Class of 1950, titled "1950: Bowdoin's Biggest and Best Class". Image View Description: Panomara photograph titled "At the Bowdoin - Maine Championship Game, Nov. 8, 1919." View is of a crowd of seated spectators wearing hats and coats. In the right foreground is a photographer photographing a seated and tethered black bear, with the caption "'Teddy' having his picture took." Image View Description: Close-up of a B.U. 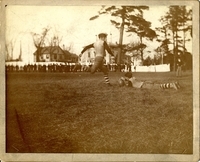 vs. Bowdoin football game, with one player attempting to kick a field goal. Titled "Ross kicks a goal". Image View Description: Portrait of Haines (Bowdoin 1898) and Bodge (Bowdoin 1898) in baseball uniforms; titled "Champion Battery". Image View Description: Informal group portrait of some members of the Bowdoin Class of 1940. Titled "Greek 3". Image View Description: Color-added postcard of Chapel partially obscured by trees and viewed from the quad. Titled "Barrister" Hall and Chapel instead of "Banister" Hall and Chapel. Image View Description: Sepia postcard titled "Hubbard Hall, The Library of Bowdoin College." Hubbard Hall is viewed from the quad. There is handwriting on the postcard and a 1906 postmark. Image View Description: Sepia postcard titled "King Chapel." The Chapel is framed by trees without leaves. There is handwriting on the postcard and a 1906 postmark. Image View Description: Black and white postcard showing a path through the pines. Postcard is titled "Bowdoin Pines Brunswick, Me." Image View Description: Colored postcard showing pathways through the pines. Postcard is titled "Brunswick, Me., The Bowdoin Pines, Bowdoin College." Image View Description: View of a military swimming exhibition at Bowdoin; titled "Class Drill". Image View Description: View of a military swimming exhibition at Bowdoin; titled "Carrying Rifles". Image View Description: View of a military swimming exhibition at Bowdoin; titled "Water Polo". Image View Description: View of a military swimming exhibition at Bowdoin; titled "Curry the Clown". Image View Description: View of a military swimming exhibition at Bowdoin; titled "The Shark". Image View Description: View of a military swimming exhibition at Bowdoin; titled "Water Wings".